The Seahawks host the Houston Texans Sunday in what on paper appears to be a strength-on-strength matchup. The Seahawks currently have the league’s best scoring defense, allowing 15.7 points per game, and the Texans owning the league’s No. 3 scoring offense (29.5) after scoring at least 30 points in four straight games. 1. Rookie Deshaun Watson vs. Seattle’s defense… and fans. The last rookie quarterback to win a game at CenturyLink Field was Cincinnati’s Andy Dalton, who helped lead the Bengals to victory over Seattle midway through the 2011 season. For a little perspective on how long ago that was, consider that that game was Richard Sherman’s first of 106 consecutive starts, postseason included. Other than that game, rookie QBs are 0-7 in Seattle since Pete Carroll took over as Seattle’s head coach, both because the Seahawks have been one of the best defensive teams in football for most of that time, and also because CenturyLink Field represents one of football’s most hostile environments. Watson played well in plenty of big games and hostile environments during his career at Clemson, but he and his team know facing a loaded Seahawks defense presents an entirely different challenge, regardless of venue. But while Watson and the Texans have their hands full, he appears to be as well-equipped as any rookie can be to take on a loaded defense in a tough venue. Since taking over the starting job, Watson has a 101.1 passer rating and has thrown 15 touchdown passes with five interceptions. He’s also a running threat, having scored twice on the ground and averaging 7.2 yards per carry. And it’s not just Watson’s physical talents that have impressed the Seahawks. 2. Doug Baldwin vs. Houston’s pass defense, especially on third down. Six games into the season, Doug Baldwin is what he has been for most of his career, one of Seattle’s best and most reliable offensive weapons. Coming off a nine-catch, 92-yard game with a touchdown, Baldwin showed again last week, and particularly on third downs, how big of a factor he can be in game. Baldwin is also a big reason why the Seahawks, for all their offensive inconsistencies, have been one of the league’s better third-down teams, converting 43.3 percent of their third-down chances, which ranks eighth in the league. Over the past three games, the Seahawks are second best in the NFL on third down at 53.3 percent. The Texans, meanwhile, are strong across the board on defense, even minus two of their best defensive players, J.J. Watt and Whitney Mercilus. And on third down, the Texans are allowing teams to convert only 34.6 percent of their chances, which ranks eighth in the league. Houston is also expecting to get cornerback Kevin Johnson, a former first-round pick, back after a four-game injury absence, making their pass defense even better. 3. Houston’s red-zone threats vs. Seattle’s pass defense. One of the big reasons why the Seahawks have the league’s top scoring defenses is that they’ve allowed touchdowns on only 28.6 percent of opponents’ red zone possessions, the best mark in the league. Conversely, the Texans are one of the NFL’s highest scoring teams because they’re scoring touchdowns on 65 percent of red zone trips, which ranks fourth in the NFL and first in the AFC. In addition to Watson’s strong overall play, one of the biggest reasons for Houston’s red zone success has been the play of receivers DeAndre Hopkins and Will Fuller V, who have combined for 11 touchdown receptions. Hopkins is Watson’s top target with 37 catches for 382 yards and six touchdowns. Injuries have limited Fuller to three games and he has just eight catches this season, but the speedy 2016 first-round pick has scored five touchdowns on those eight catches and is averaging 19.3 yards per reception. 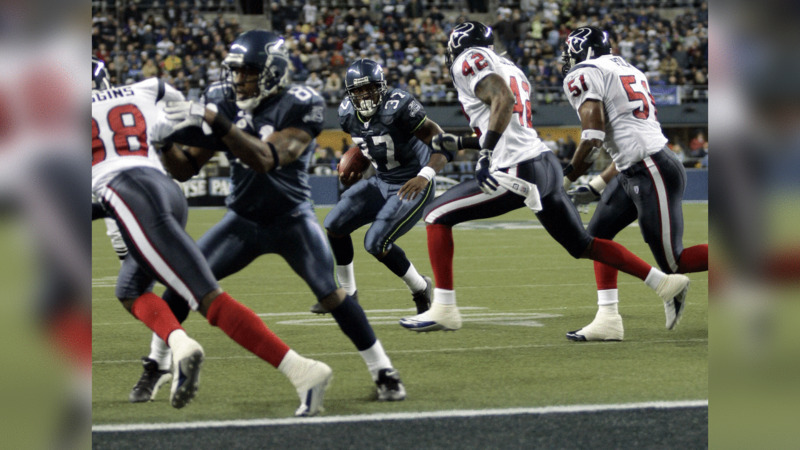 Take a look back through history at the Seahawks' matchups against the Texans as the two teams ready to face off during Week 8 at CenturyLink Field.